Rosemary Tree my mother gave me, it signifies remembrance. Since my cooking class at Stonewall Kitchen, I have been inspired by this idea of Heirloom Recipes! Holiday time is the perfect time to use simple, seasonal ingredients and recipes that connect us to memories every time we make them. Adding our own twist or spin on to a recipe should be a welcomed thing, and it almost puts a stamp on that moment time and allows that memory to live on. 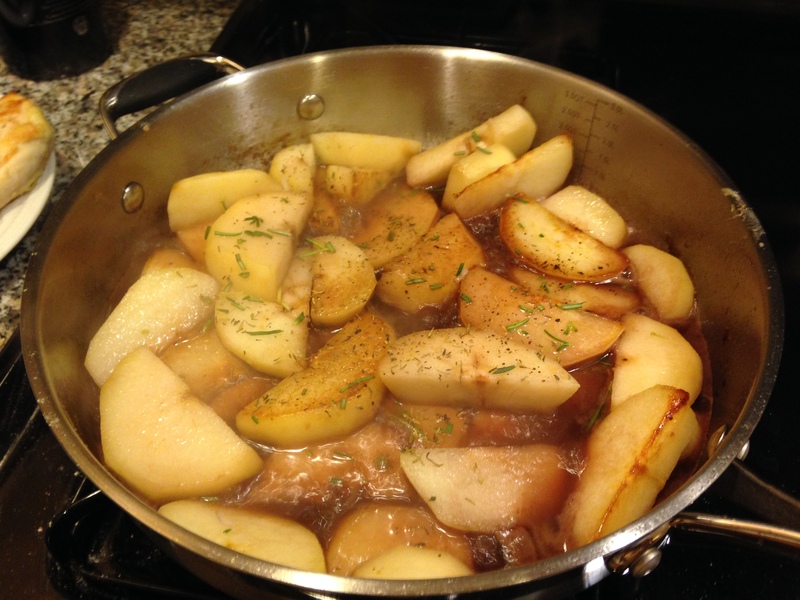 Recently I have come across a recipe that is so easy, yet elegant and delicious, it is worthy of the Heirloom Recipe title, that I plan to share with family and friends for years to come. Part of why I love this recipe is it is has rosemary in it, which happens to be my favorite herb of all time. The wonderful smell of rosemary I associate with good food and great times. Rosemary also has some health benefits. It is a rich source of antioxidants and anti-inflammatory compounds- which is thought to boost immunity and aid in digestion. My mother has been giving rosemary trees as gifts for years. And this year we discovered the plant symbolizes remembrance, which is perfect for an Heirloom Recipe. Step 1:Preheat oven for 350 degree. 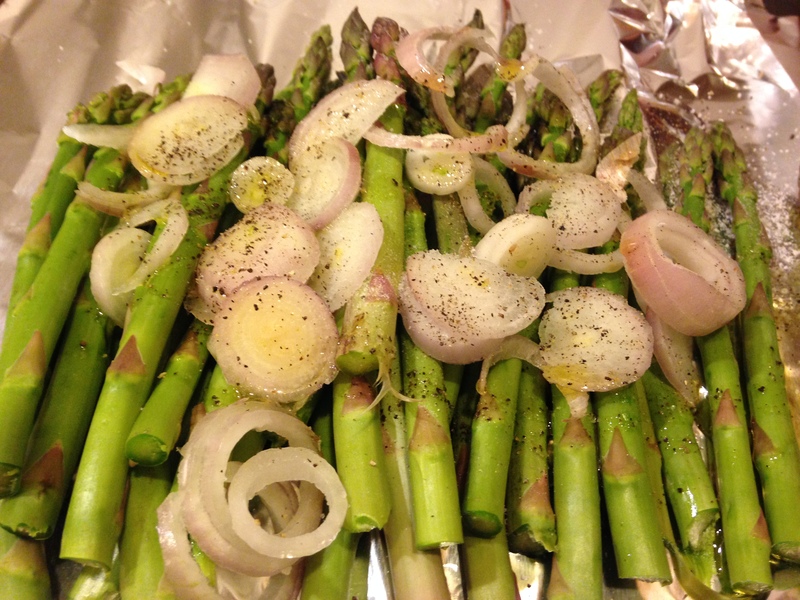 Remove ends of Asparagus, dice shallots and place on a cookie sheet. Drizzle with olive oil, salt and pepper to taste. Bake for 15 minutes. 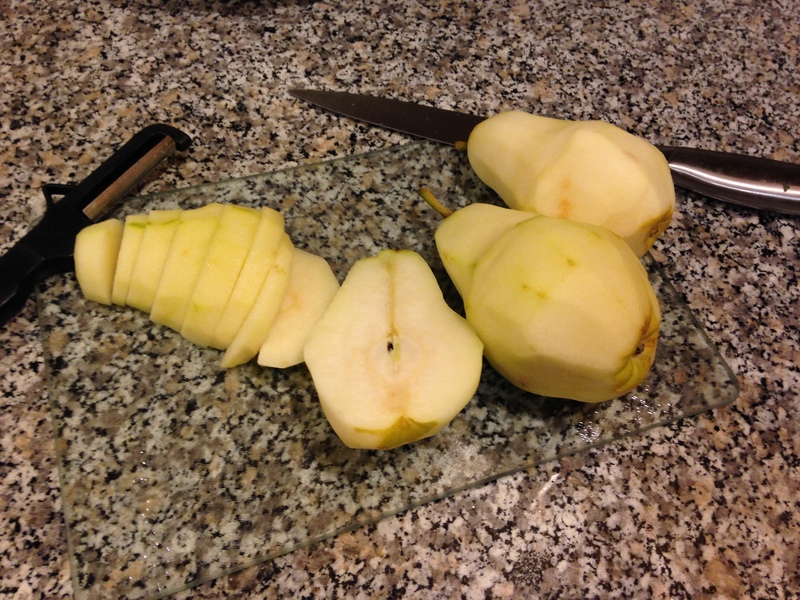 Step 2: Peel and chop pears. Halve pears length wise and than make thick slices crosswise. Step 3: In large skillet heat 1 Tbsp vegetable oil over medium heat. 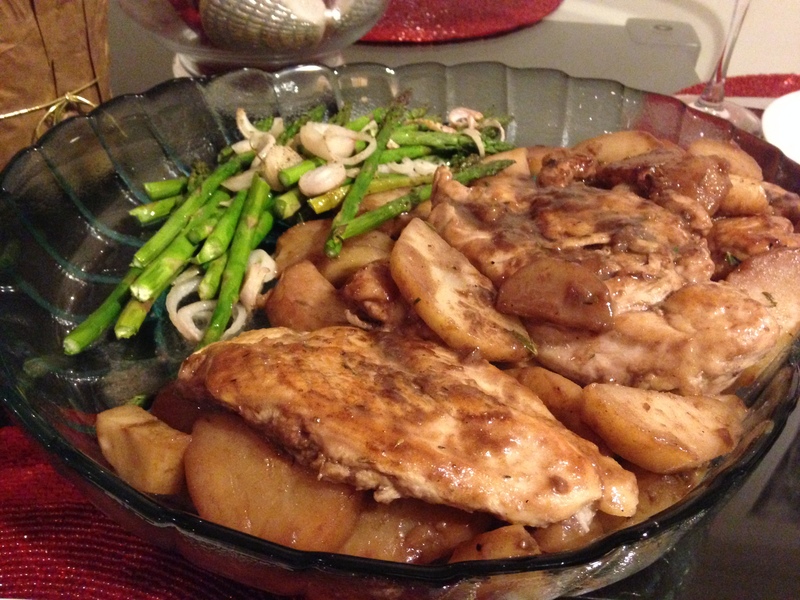 Dredge chicken breast in flour. Add to skillet, cook until golden brown. About 3 minutes per side, when down transfer to a plate. 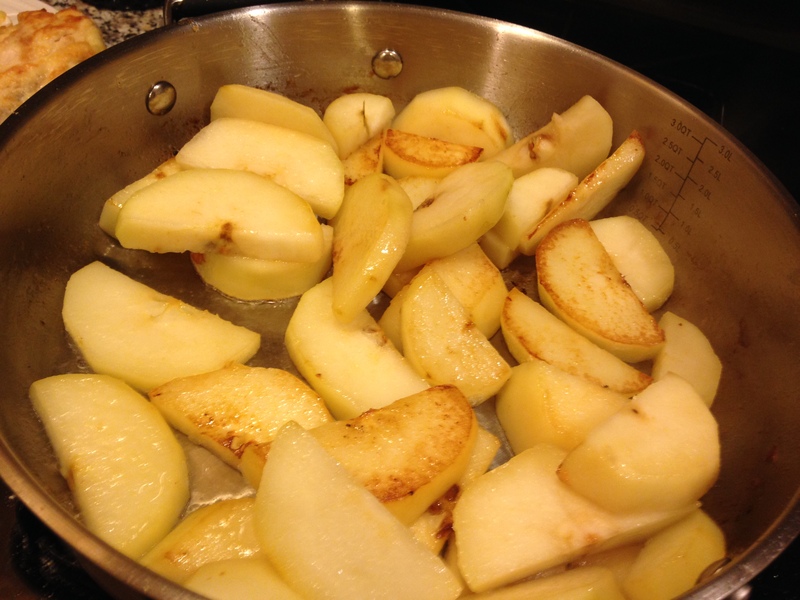 Step 4: Add remaining 2Tbsp oil to skillet and the pears. Cook until lightly browned, about 4 minutes. Step 5: Add wine, bring to boil and cook for 2 more minutes. Step 6: Add chicken stock, balsamic vinegar, salt, rosemary, thyme and pepper. 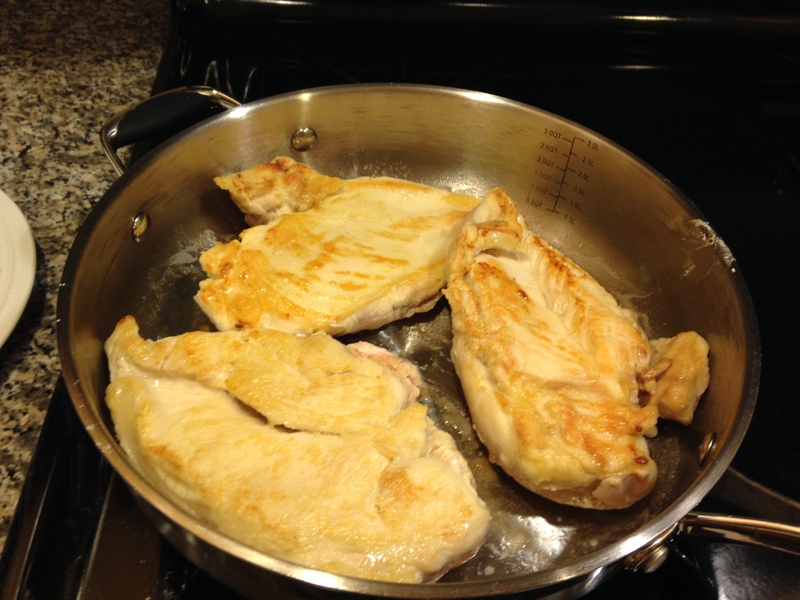 Return chicken to skillet and simmer until chicken is cooked thoroughly through. Typically 5-7 minutes. Step 7: Remove chicken and pears from the heat and transfer to platter. 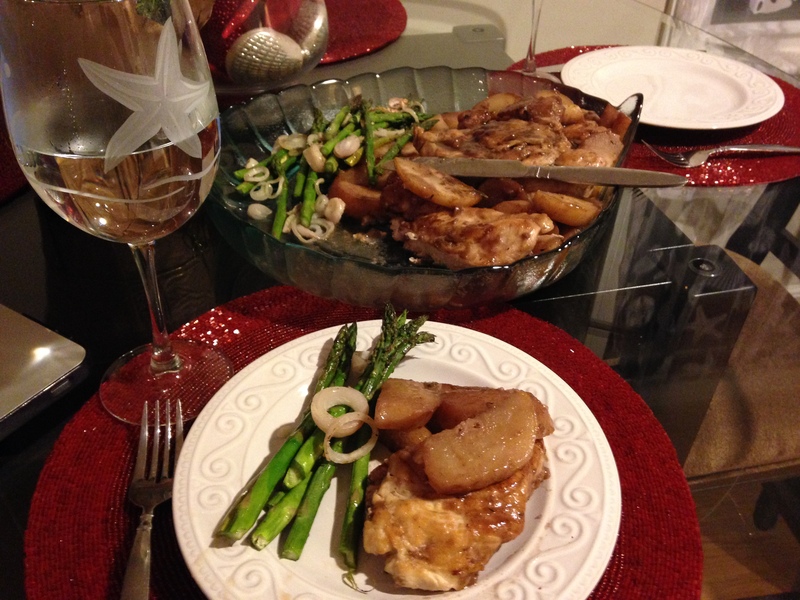 Pour remaining sauce over the dish and enjoy! 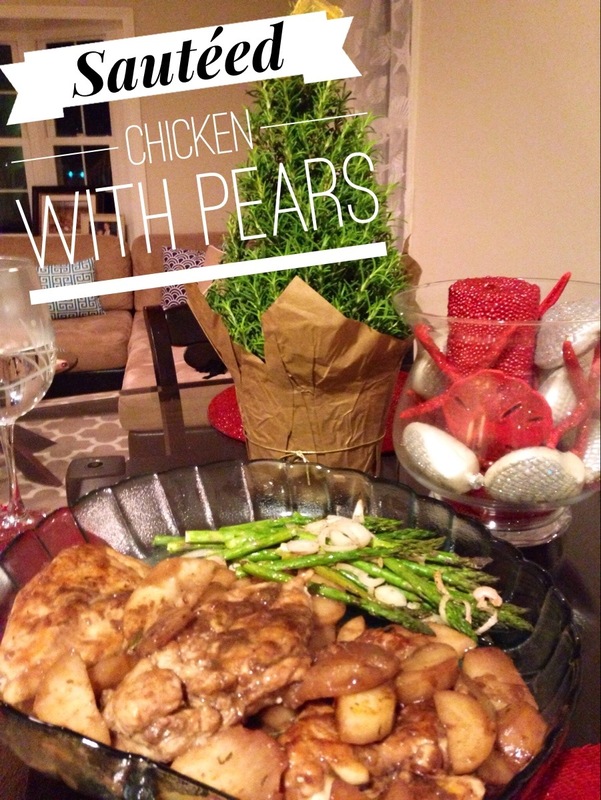 This entry was posted in Dinner, Healthy Holiday Advent!, Quick & Healthy, Uncategorized and tagged Cooking, Holiday, holiday time, Homemade, Prep Day, Quick, vegetables, weight health, Weight loss. Bookmark the permalink.